Snow, originally uploaded by [Zakkaliciousness]. Dressed for the winter weather, she sped along happily towards the city centre. Danes are quite obsessed with the snow due to the fact that so many are avid skiiers. My friends and I can quote the current snow depth at any given resort in France, Italy or Austria. Even the TV channels have a 'snow watch' page on their websites. Although the page merely says, "No snow on the horizon for the coming days". You want snow? Come to Toronto, Canada. We've had 50 cm of snow fall since last Friday. I am so sick of shovelling! Despite the fact that the snow storm was only just tapering off this morning and the roads was a colosal mess, I did see an intrepid cyclist while on my way to work this morning. Sorry no photo. You wouldn't have liked it anyways. 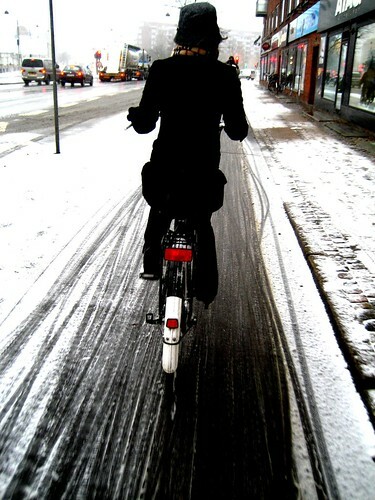 When cycling in a snowstorm in Toronto, the last thing you worry about is 'chic'. 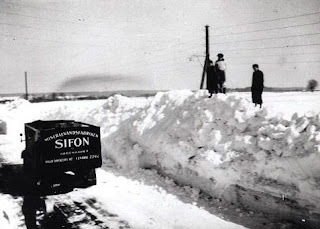 but don't you have snowploughs to clear the snow in such a large city? when we get dumped on with snow, whether 5 or 50 cm is usually cleared off the roads and bike lanes right away. In Ireland we rarely get snow, maybe some on the mountains and even if we do get a few sprinkles it's always melted straight away. I have to go back many years to my childhood to remember a proper snow fall. I lived in Sweden for 8 years and loved the snow there. I miss Sweden . I live on a rain sodden permanently damp little Isle battered by Atlantic rain and wind. I reckon we have as many words and phrases to describe rainy weather as the Inuits do to describe snow-"It's a soft day, thank God"-light rain. Or "It's only weather for ducks today"-heavy rain. And when the sun does shine we complain that it's too hot. We have an old saying here: "If you don't like the weather, wait 5 minutes. Says it all really. i've heard that phrase "if you don't like the weather wait 5 minutes" in many a country. ireland is much like denmark... perhaps a bit wetter.